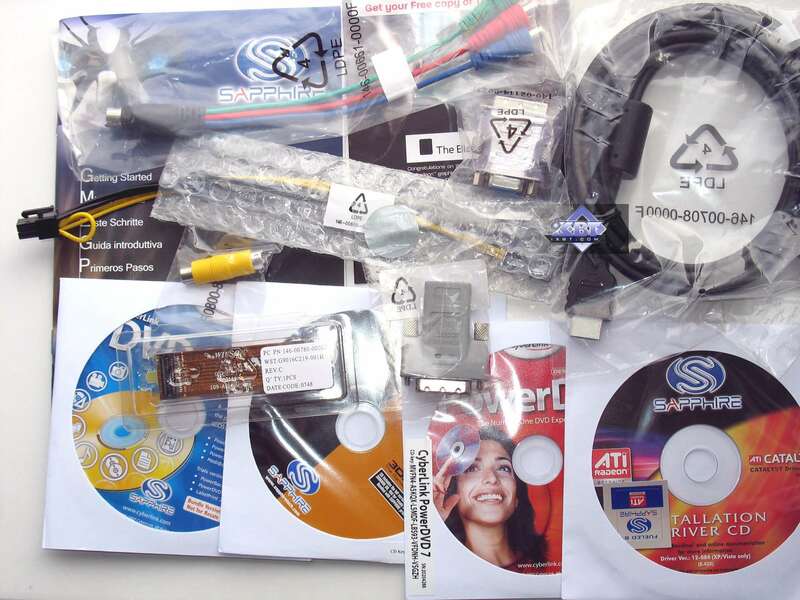 We haven't reviewed Sapphire products for a long time already, although they appear on the market as if from the horn of plenty. Out of multiple usual HD 38xx graphics cards we've selected two products with different memory size and customized cooling systems. 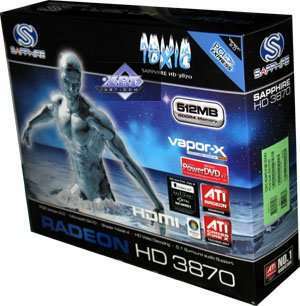 We must admit that reviewing graphics cards on AMD GPUs has become troublesome of late. If there are no problems with drivers in 3D rendering, such products demonstrate performance in between similar results of NVIDIA cards. It's rather difficult to compare. AMD has to constantly change prices, to keep up buyers interested in its products. And that might distort the conclusions in our RADEON reviews. For this reason we have to either be wordy in such reviews or, sometimes, skip conclusions at all, describing only prices. It's well known that the RADEON HD 3870 is generally outperformed by the GeForce 8800 GT. However, AMD is cutting down prices, so it's becoming hard to say which card is better. While the U.S. market is rather responsive to changes in pricing, our local Russian market may be more inert. 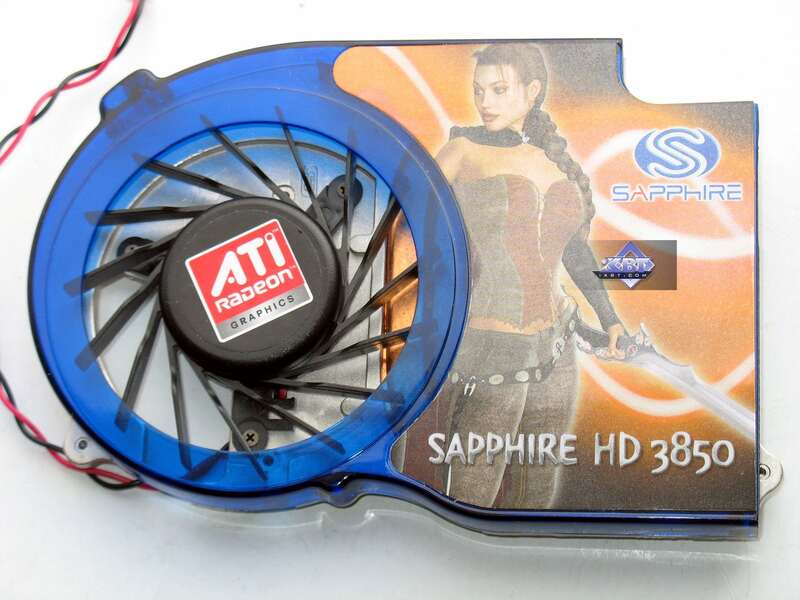 So, the HD 3870 and the 8800 GT might still have similar retail prices, even though release prices may differ much. The HD 3850 is in a similar situation. 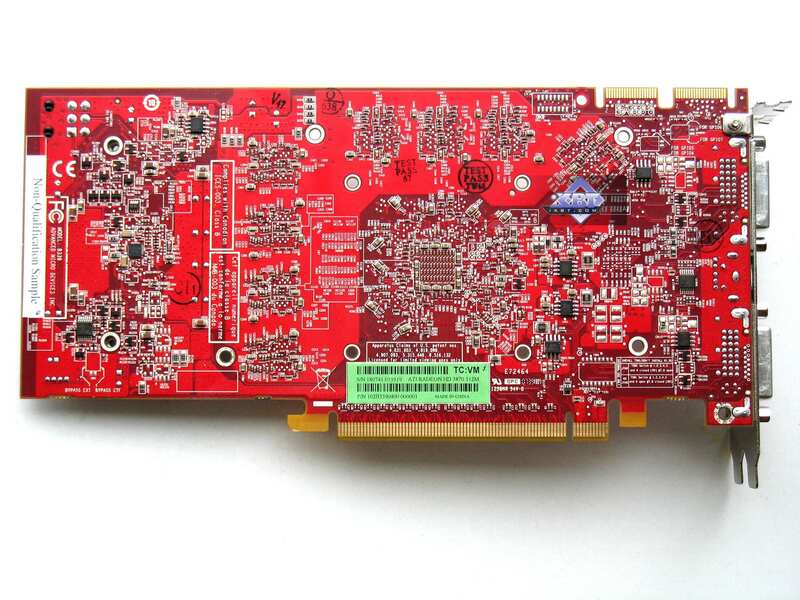 The new GeForce 9600 GT had looked much better because of its price, but AMD cut prices down, so the 3850 should be between the 9600 and the 8600. However, since our market is inert and retail prices are strange to say the least, it's hard to say whether the 9600 is better or not. When a company loses its leadership in the segment of image products, it stumbles upon issues with product positioning. When ATI was the leader, everything was simple. 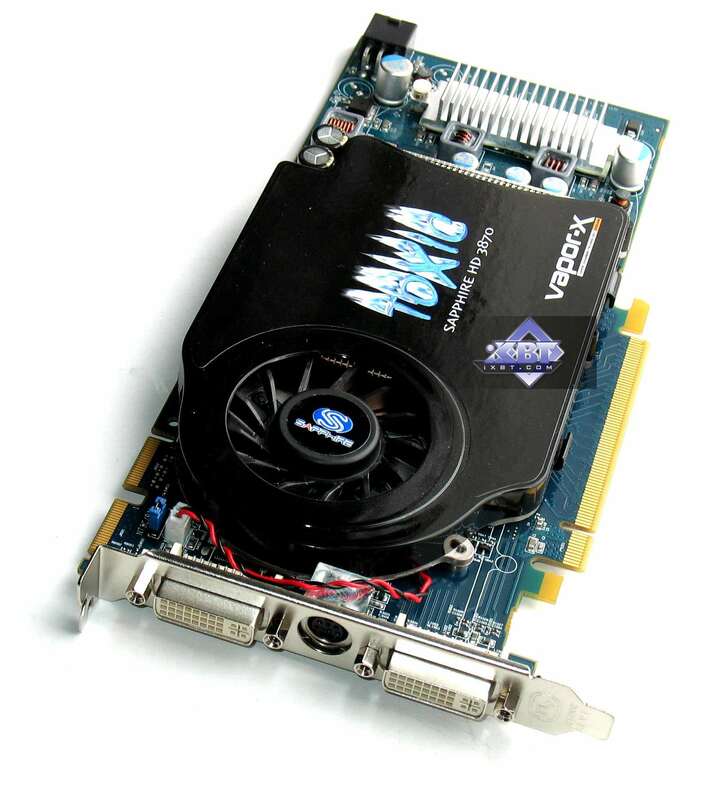 But now it has to manufacture initially medium-performance cards and play with prices. However, this is a slippery parameter, which must be manipulated with caution. Thus, the price/performance ratio is prone to change, and we cannot say for sure which graphics card is definitely better or worse. 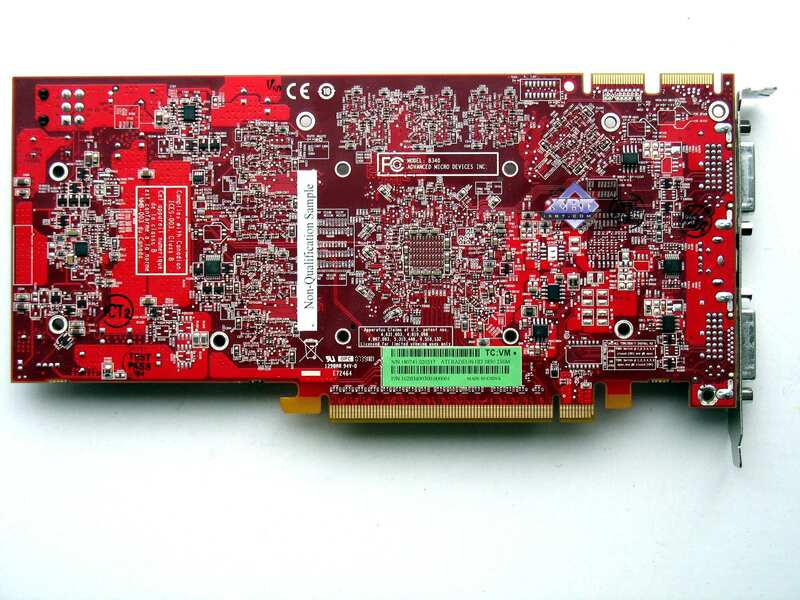 Dimensions: 220x100x15 mm (the last figure is maximum thickness of the graphics card). Output connectors: 2xDVI (Dual-Link/HDMI), TV-Out. The card has 512 MB of GDDR4 SDRAM allocated in eight chips on the front side of the PCB. 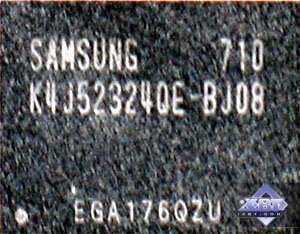 Samsung memory chips (GDDR4). 0.8 ns memory access time, which corresponds to 1250 (2500) MHz. 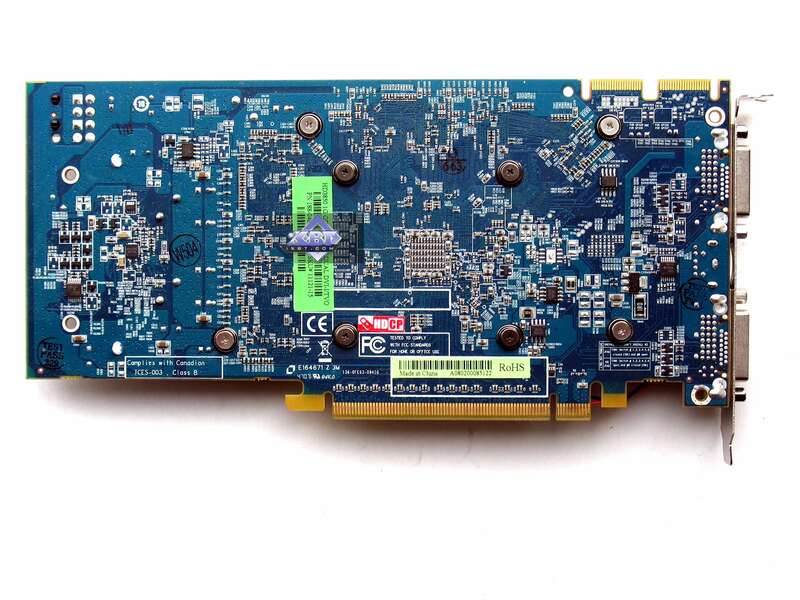 The card has 1024 MB of GDDR3 SDRAM allocated in eight chips on the front side of the PCB. 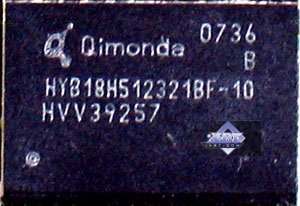 Qimonda memory chips (GDDR3). 1.0 ns memory access time, which corresponds to 1000 (2000) MHz. Both graphics cards are apparently based on reference designs with minor changes that have to do with different memory types (DDR3/DDR4). On the whole, we didn't notice any significant simplifications that could deteriorate operating stability of the cards. Both cards have TV-Out with a unique jack. You will need a special bundled adapter to output video to a TV-set via S-Video or RCA. You can read about the TV-Out in more detail here. What concerns HDTV. You can read one review here. 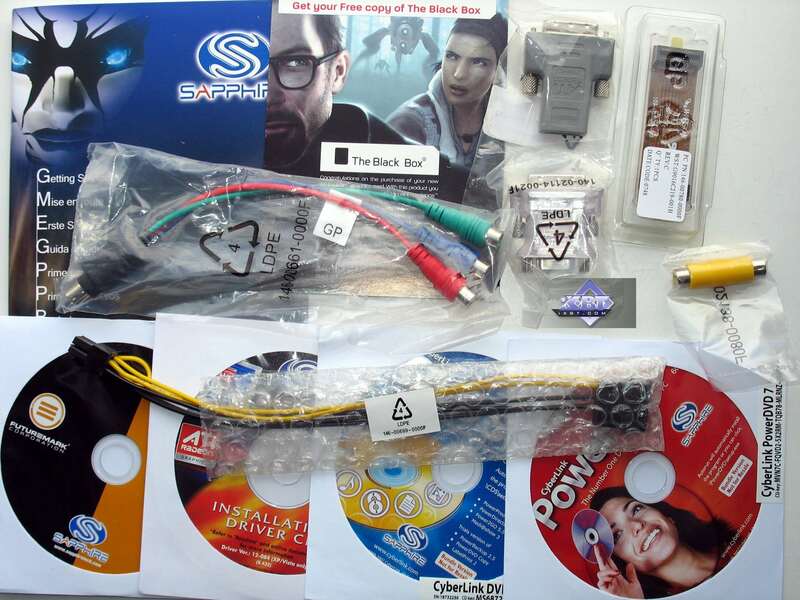 Both cards require additional power supply, so each card is bundled with an adapter from molex to 6-pin, even though all modern PSUs are equipped with these cables. Now let's proceed to the cooling systems. 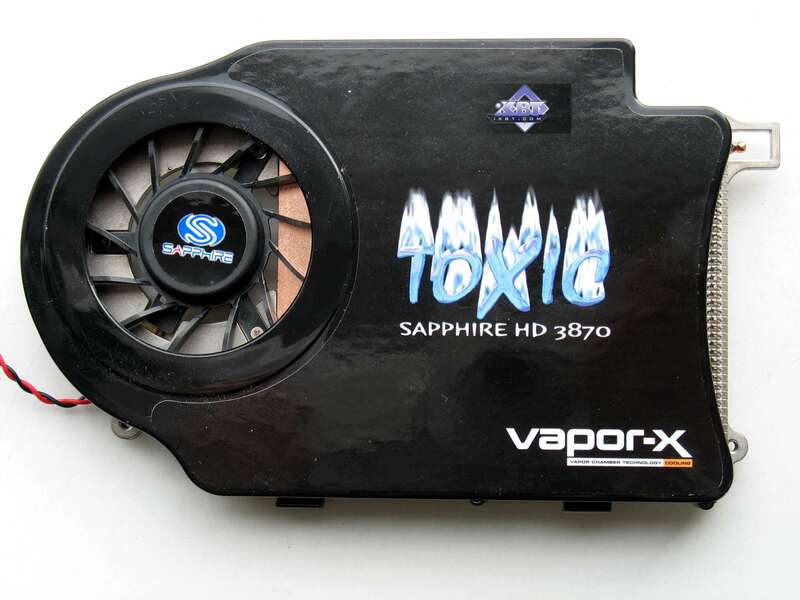 This is a classic cooler: a narrow closed heat sink with a turbine that blows the air through. This concept appeared long ago, back in 2001, in the GeForce4 Ti. 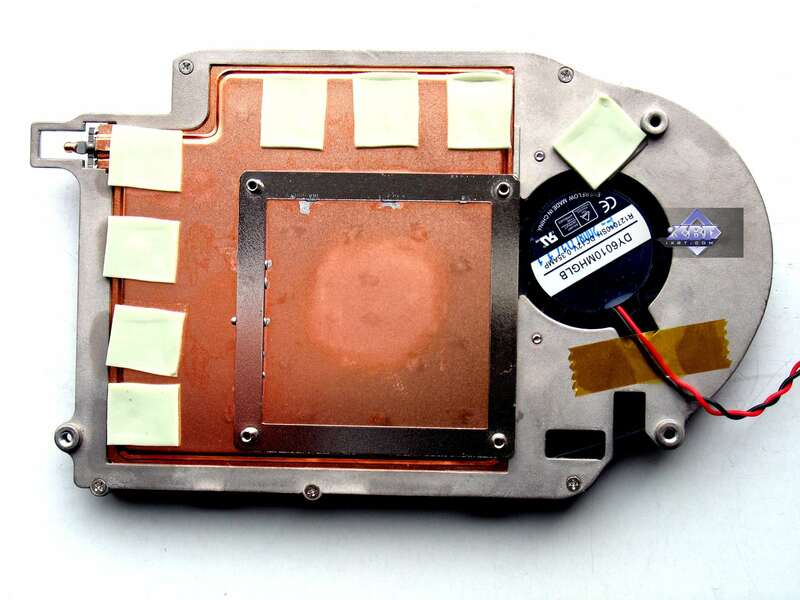 Such coolers have changed shapes and sizes of heat sinks, turbine types, but their principle of operation has remained the same. These coolers may be very noisy, when the turbine pumps air through the heat sink at high speed. 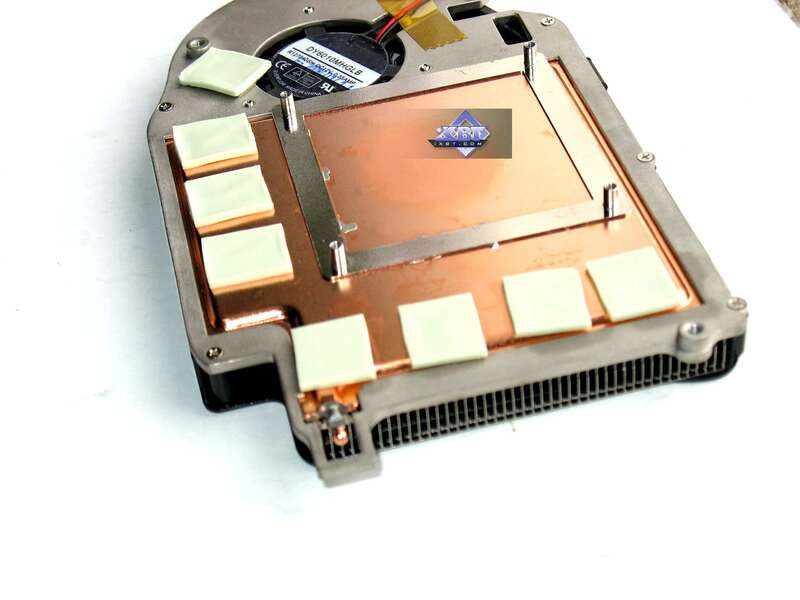 But if engineers choose fan size and type correctly, in combination with the shape and size of a given heat sink, users can get efficient cooling for the GPU and memory chips at a moderate fan speed, so a cooler may be practically noiseless. 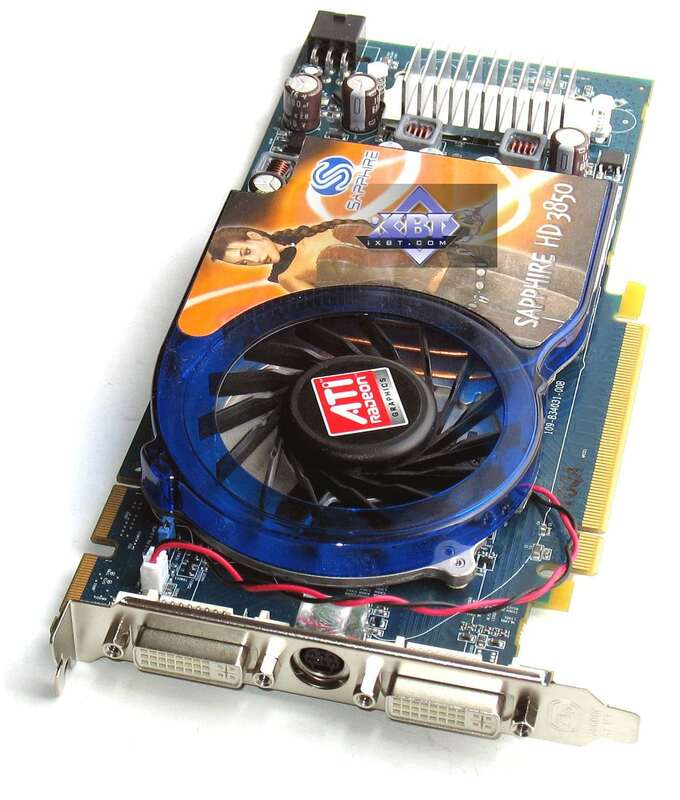 In this case engineers managed to find an optimal solution, the cooler on this card is almost noiseless. 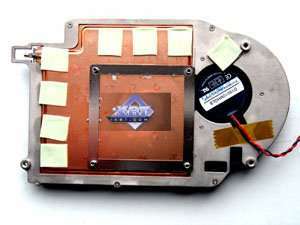 Note that the device cools both the GPU and memory chips. 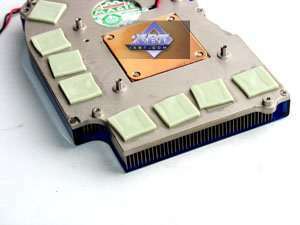 The cooling system takes up only one slot, so it cannot throw the hot air out of a PC case. 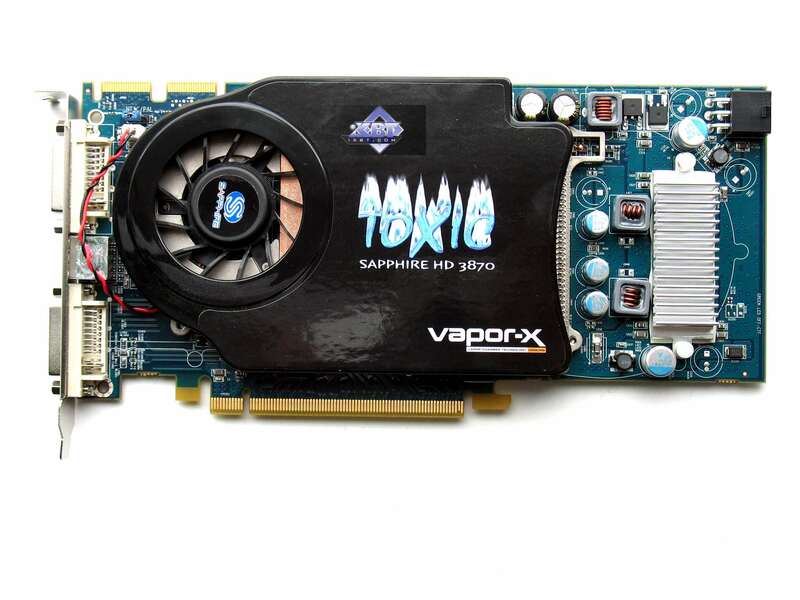 This solution on the Toxic card, resembles the previous device, but it uses an original cooling system—Vapor-X. This cooling system is based on Vapour Chamber Technology (VCT), which helps combine compact dimensions and high efficiency. 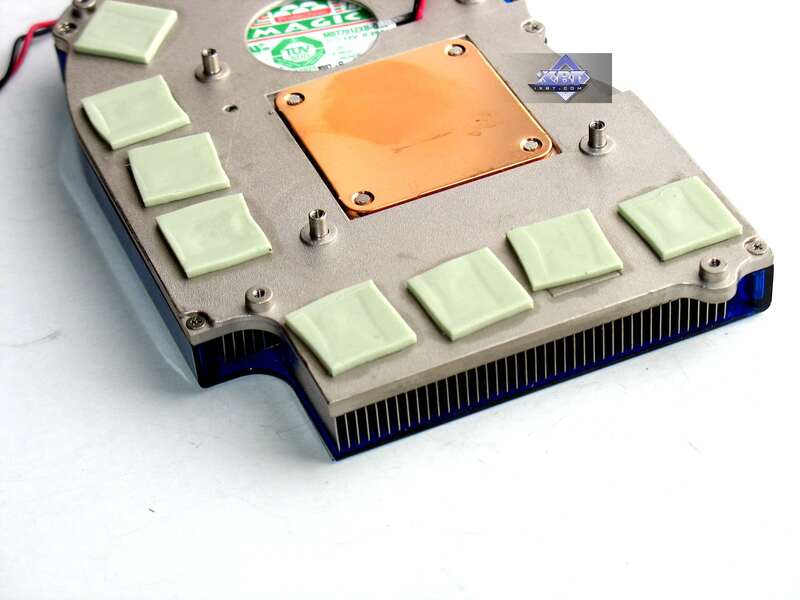 The cooler is also reinforced with a larger, more powerful copper heat sink, so it can cool the card efficiently remaining practically noiseless. As you might have already noticed, both cards have essentially identical cores, they differ only in operating frequencies. And they use different memory types. This cooling system takes up only one slot, but the hot air stays inside a PC case. 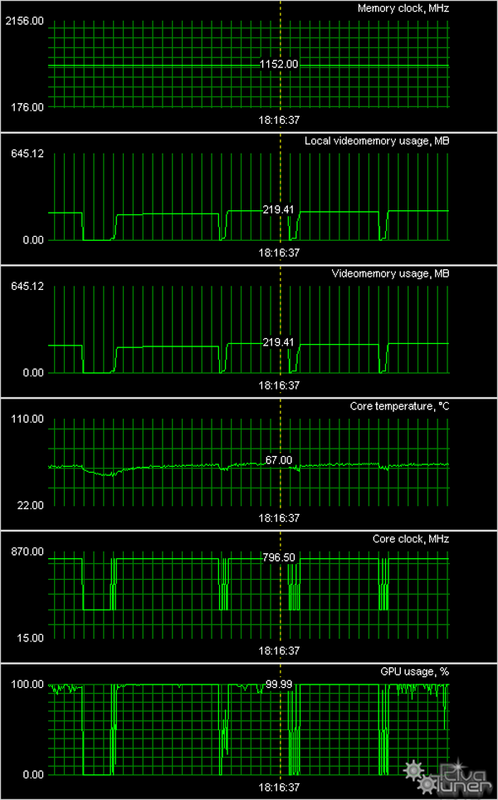 As we can see, both cooling systems have proved their efficiency even though both cards operate at increased frequencies. There is almost no noise. 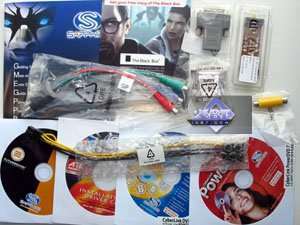 The basic bundle should include: User's Manual, CD with drivers and utilities, a DVI-to-VGA adapter, a DVI-to-HMDI adapter, a CrossFire bridge, a component output adapter (TV-out), and an external power splitter. And now let's see what other accessories are bundled with each card. The basic bundle is supplemented with an HDMI cable, CDs with PowerDVD 7.0, 3DMark06, and DVD Suite. It's a very good bundle! It's a similar bundle—it just lacks an HDMI cable (perhaps, this bonus is added only to Toxic cards). This box is inside a bright glossy jacket, dark palette, nice design. There is a cardboard box inside without any compartments. 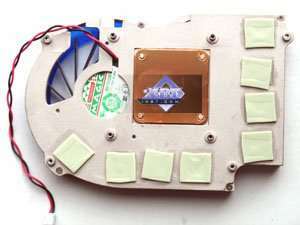 Bundled components are just scattered inside with two pieces of foam-rubber covering the card. The foam-rubber is thick enough to protect the card in transit, but it does not seem an appropriate solution for such a company. The package is identical, only its jacket has a different design: black colors, the name of the card is printed in silver, so you cannot see it well at some angles. The other titles are bright and distinct. Call Of Juarez (Techland/Ubisoft)—DirectX 9.0, shaders 3.0 (HDR), demo (demo). Tests were run with maximum quality settings. The batch file is included. S.T.A.L.K.E.R. 1.003 (GSC Game World/THQ)—DirectX 9.0, demo. You should unpack the files into the game folder with savegames (Documents and settings). When the game starts up, load ixbt3, open the console, and start the demo: demo_play ixbt3. Test settings—maximum (Dynamic Lights ENABLED). 3DMark05 1.20 (FutureMark)—DirectX 9.0, multitexturing, trilinear filtering. CRYSIS 1.1 (Crytek/EA), DirectX 9.0c/10.0, shaders 3.0/4.0, (batch file to start the test), test settings in MS Windows Vista—Very High (DX10), Windows XP—High (DX9), RESCUE and HARBOR levels). You can e-mail us to get the timedemo. We express our thanks to CRYTEK for writing timedemo for Digit-Life.com / iXBT.com. Company Of Heroes (Relic Entertainment/THQ)—DirectX 9.0, shaders 2.0, startup batch file. When you start the game, you should go to options, choose the graphics section, and press the test button. Tests were run with maximum quality. 3DMark06 1.10 (FutureMark)—DirectX 9.0c, multitexturing, trilinear test settings. If you have a decent understanding of 3D graphics, you may draw your own conclusions for the charts below. However, if you are interested in our comments on test results, you may read them after each test. Anything that is important to beginners and those who are new to the world of graphics cards will be explained in detail in the comments. If you have just begun realizing how large the selection to choose a graphics card is, don't worry, our 3D Graphics section offers articles about 3D basics (you will still have to understand them—when you run a game and open its options, you'll see such notions as textures, lighting, etc.) as well as new product reviews. We also publish monthly i3DSpeed that sums up all comparisons of graphics cards for various price ranges. Thirdly, have a look at the test results. We are not going to analyze each test in this article, primarily because for us it makes sense to draw a general bottom line in the end. We will, however, make sure that we make our readers aware of anything unusual. 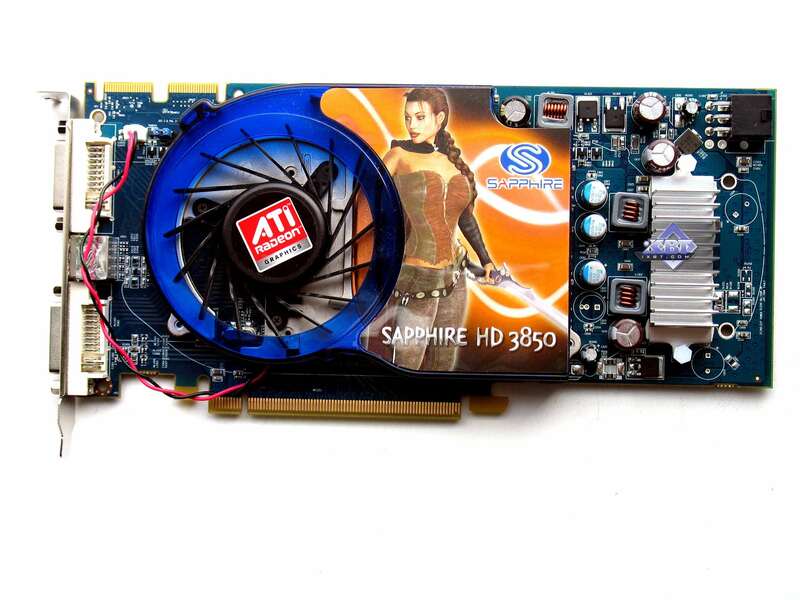 Sapphire RADEON HD 3850 1024MB PCI-E is a very interesting graphics card. 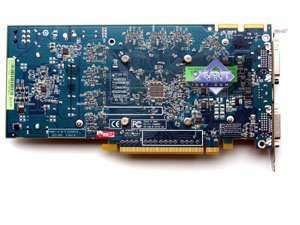 It's the first single-GPU graphics card with 1GB of video memory we've seen. Only dual-GPU cards used to have so much memory (either on a single or two PCBs). Tests have demonstrated that such a card does not need so much memory. If a gamer wants to use maximum settings in games, he/she will be forced to limit the resolution to 1024x768 or a tad higher. In this case, so much memory will be of little use. We may even say that it will be useless. 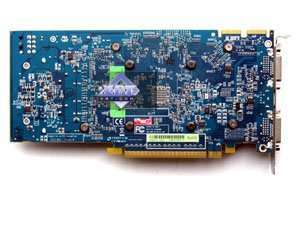 It's also strange to see the card use very fast memory chips that can operate at 1000 MHz, while the card uses them at 830 MHz. 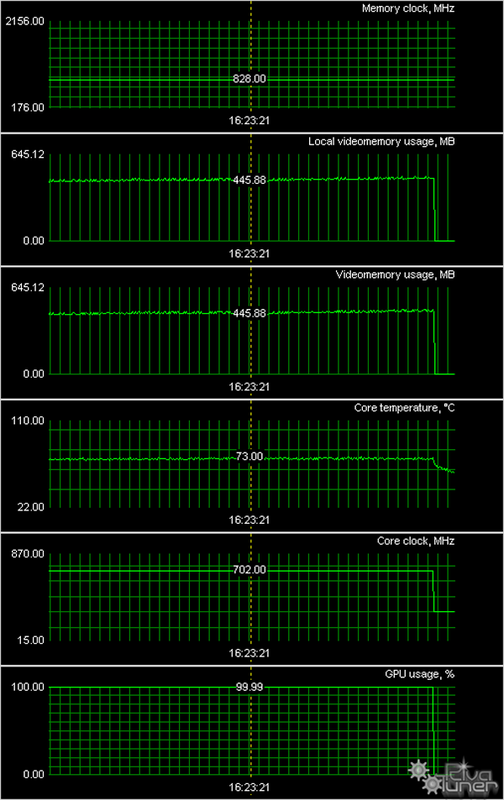 I think that the cooling system can easily cope with such memory operating at its nominal frequency. Only the manufacturer knows the reasons why it was done. If this card's cost is not much higher than the general price tag for the 3850 cards, this product will be very interesting. 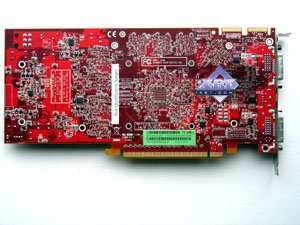 But I repeat that such cards do fine with 512MB of video memory. 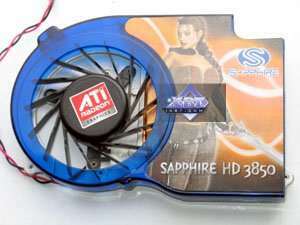 Sapphire RADEON HD 3870 Toxic 512MB PCI-E is actually the most powerful single-GPU graphics card based on the AMD GPU. To be more exact, it's one of the most powerful cards, because there is also a card from HIS operating at higher frequencies. It has a good design with a quiet cooling system. It's a matter of preference whether you should choose a single-slot cooler, which cannot throw the hot air out of a PC case. The cooler copes with its task well, but I cannot tell you whether ejecting hot air out of a PC case is really mandatory. 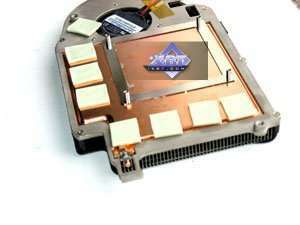 If a noiseless dual-slot cooling system is used, then the answer is "yes". And if it's noisy, there is no point in using it. 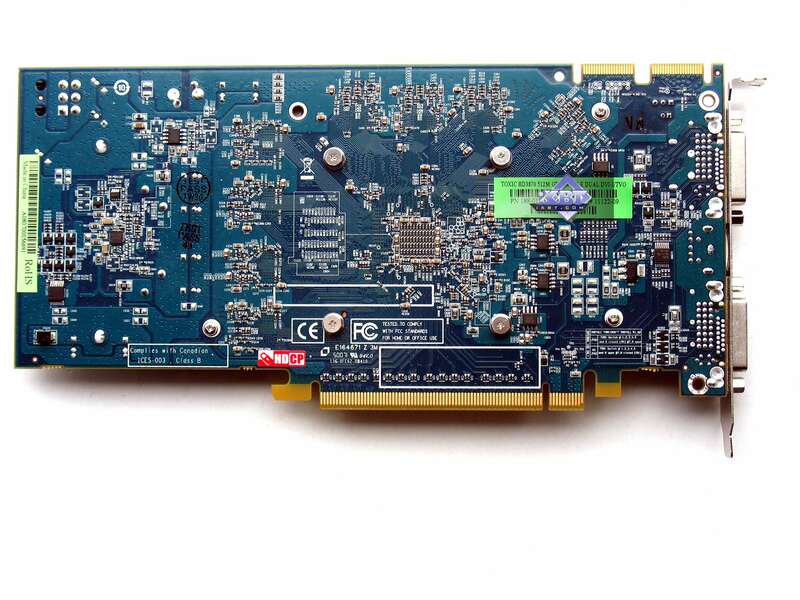 On the whole, the card offers increased operating frequencies and a good cooling system. But you should consider the situation with prices again. Our tests proved that the 3870 family is generally outperformed by the 8800 GT. So if you find the latter cheaper than the 3870, you don't hesitate and buy it. The 8800 GT, of course. But if prices are adequate to performance... Then it's a difficult question. And another thing that we are not tired to repeat from article to article. Having decided to choose a graphics card by yourself, you have to realize you're to change one of the fundamental PC parts, which might require additional tuning to improve performance or enable some qualitative features. This is not a finished product, but a component part. 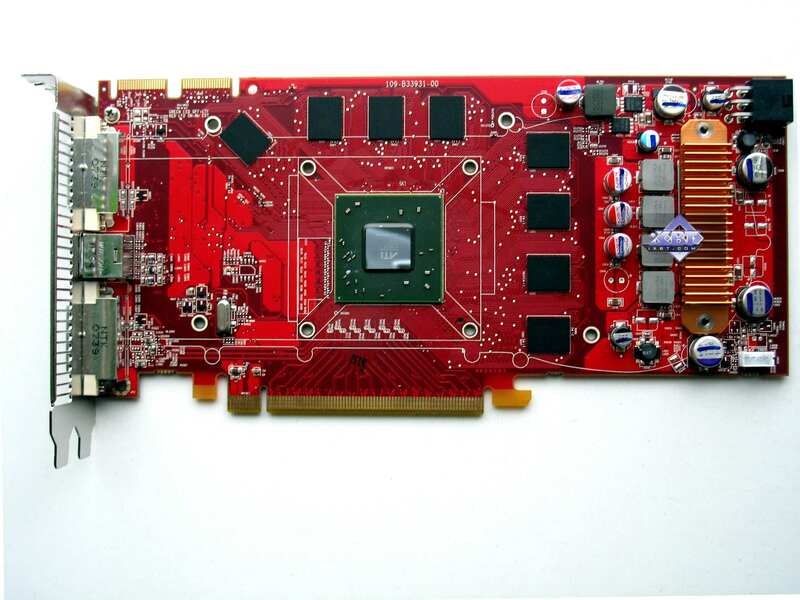 So, you must understand that in order to get the most from a new graphics card, you will have to acquire some basic knowledge of 3D graphics and graphics in general. If you are not ready for this, you should not perform upgrades by yourself. In this case it would be better to purchase a ready chassis with preset software (along with vendor's technical support,) or a gaming console that doesn't require any adjustments. 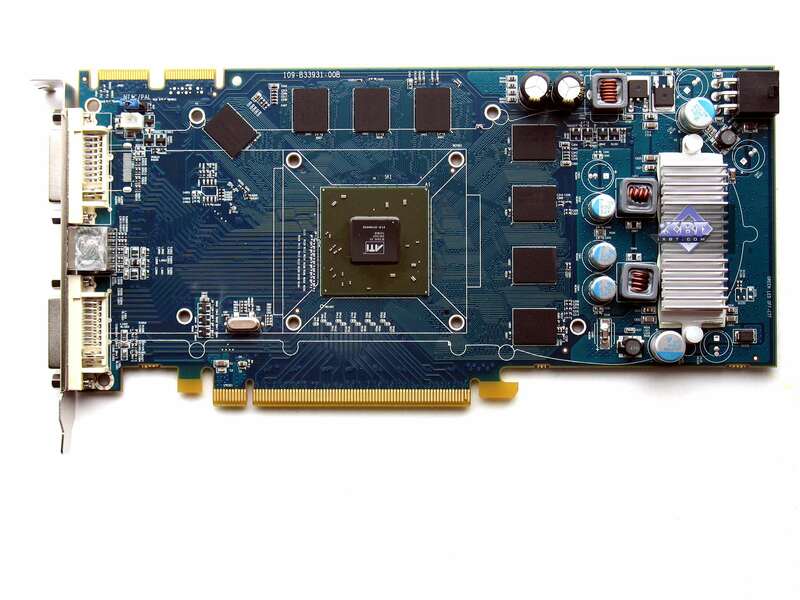 To find more information regarding the current graphics card market and the performance of various cards, feel free to read our monthly special i3DSpeed. for the provided graphics cards.